Ric Payne, the head of Principa.net recently published the results of a research project on the business planning undertaken by accounting firms in the US, New Zealand and the UK. As Ric says, this research project was not what you’d call a very carefully designed and controlled project one should not draw any firm conclusions from the results. However it did throw up some interesting observations from which some useful hypotheses emerge. Do accounting firms invest time in planning their own business? Most firms in the survey do have a planning process in place. Ric suspects this is probably a biased result for firms as a whole for two reasons: (1) people who are in Principa’s client and prospect database tend to be accountants who are more likely to be at the leading edge that those who are not, and (2) his guess is that people who do not have a planning disposition are less likely to respond to this type of survey than those who do. Do firms that plan, experience greater revenue growth than firms that don’t? 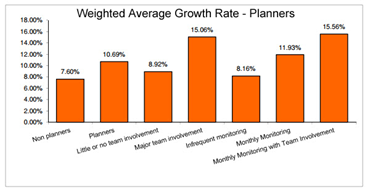 Do firms that plan and involve their team grow faster than firms that don’t involve their team? How frequently do firms that plan monitor their plan and is there any correlation between their monitoring frequency and their revenue growth rate? Do firms that plan have a detailed strategic plan or is their plan simply an operating cash flow and profit plan? Do firms provide business planning services to their clients as a standard service? 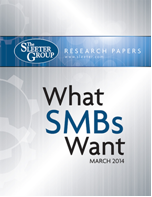 The full What SMBs Want 2014 study is available from here . The Sleeter Survey looked at small business owners on a variety of factors that involve CPAs, from how they prefer to communicate with their financial professional, how tech-savvy that pro is, what services their accountant provides, and why they’ve switched CPAs in the past. Small business owners face constantly changing competition and are looking for ways to get ahead and stay there, and they expect their accountant to help them meet this challenge. When the only advice they get is reactive (rather than pro-active), clients hit the “find a new accountant” button more often than not. Martin Pollins is a Chartered Accountant and MBA with wide experience in corporate finance and business management. He has served on the boards of several companies, including those listed on the London Stock Exchange, AIM and OFEX. He is Chairman and Founder of OneSmartPlace and was a Council member of the Institute of Chartered Accountants in England and Wales from 1988 to 1996. He was managing partner of PRB Martin Pollins, based in Sussex, the first Accountancy firm to advertise on British television.He went on to create and launch the CharterGroup Partnership (the UK’s first Accountancy network) and then LawGroup UK (at the time, one of the largest networks of lawyers in the UK). In recent years, he helped to raise several £millions to fund British films such as The Da Vinci Code, Bridge of San Luis Rey, Head in the Clouds and Merchant of Venice with actors such as Charlize Theron, Robert De Niro, Al Pacino, F. Murray Abraham. Kathy Bates, Gabriel Byrne, Geraldine Chaplin, Tom Hanks, Ian McKellen, Audrey Tautou, Penélope Cruz, Steven Berkoff, Lynn Collins, Jeremy Irons, Joseph Fiennes and many more.